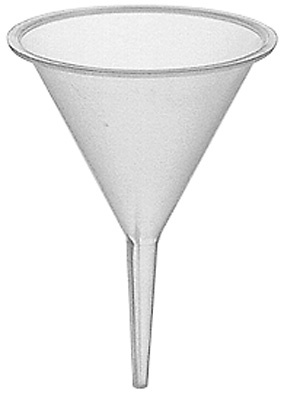 Plastic Micro-Tip Funnel has narrow tip for filling glass candles, perfume bottles, etc. Tip may be trimmed to allow a heavier flow. Measures 1-1/2" dia. and 2-1/8" long overall. Bottom opening is 1mm in dia. Funnel is clear in color. overall. Bottom opening is 1mm in dia. Funnels must be ordered in multiples of 6 pieces of a number. Funnel is clear in color.